Water protectors from the Klamath, Trinity, Sacramento and Pit Rivers rally in front of the federal building in Sacramento to oppose the Trump plan to “maximize water deliveries” from the Sacramento-San Joaquin River Delta. Photo by Dan Bacher. Members of the Yurok Tribe on the Klamath River, Hoopa Valley Tribe on the Trinity River, Winnemem Wintu Tribe on the McCloud River and the Pit River Tribe joined with commercial and recreational fishing groups and Restore the Delta to protest Trump administration water grab in front of the federal building on Capitol Mall in Sacramento on January 23. 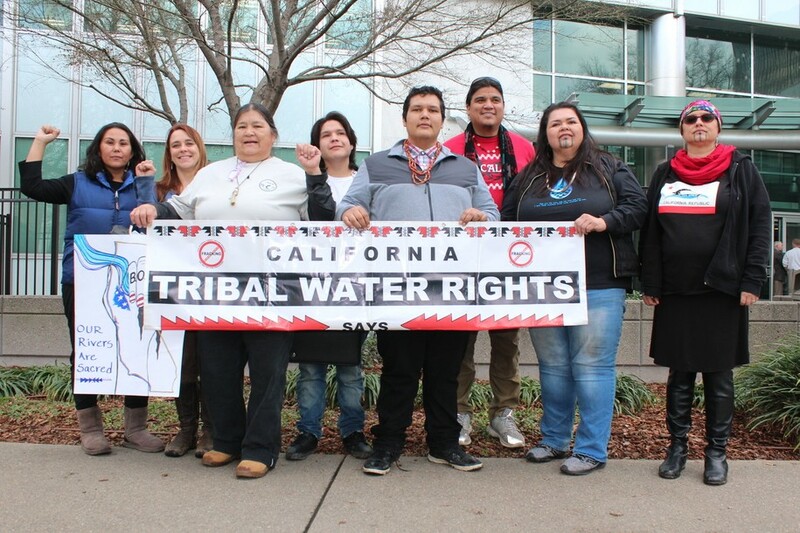 Many of them also later testified at a public comment period inside the building to voice their opposition against the Trump Administration’s proposal to “maximize water deliveries” to the federal Central Valley Project. In fact, every single one of the 15 people that spoke at the meeting testified against the increased exports plan. They spoke to stop a proposal to increase Delta exports to agribusiness interests that could devastate populations of salmon, steelhead and other fish species on the Sacramento, Feather, American, San Joaquin, Trinity, and Klamath Rivers at a time when salmon populations on many rivers and Delta smelt numbers have reached historic lows. “We are all aware that maximizing water flows to the Central Valley does not mean sending clean drinking water to residents—it means meeting corporate demands that waste water on fracking and unsustainable Big Ag industries,” she emphasized. The Klamath and Trinity rivers witnessed the worst fall run Chinook salmon return in recorded history, leading to a disaster declaration in California and Oregon due to the loss of the commercial fisheries. The recreational fall Chinook salmon fishery in both the ocean and the Trinity and Klamath rivers was also closed in 2017. The Yurok Tribe, California’s largest tribe, faced a subsistence allocation of just one fish per eight Tribal members, due to the Klamath River having the worst salmon run in history last year. Although the plan is being currently promoted by the Donald Trump administration, it is based on legislation sponsored by Senator Dianne Feinstein and signed by President Barack Obama right before he left office in January 2017. Dania Rose Colegrove, Hoopa Valley Tribe Member and organizer for the Klamath Justice Coalition, said 49 percent of the water from the Trinity, the largest tributary of the Klamath, is diverted to the Sacramento River through a tunnel that takes water from Trinity and Lewiston Dams through the Trinity Mountains into Whiskeytown Reservoir. The water is then released from the Whiskeytown Dam into Clear Creek, a tributary to the Sacramento River, until it is diverted into the Delta Mendota Canal to be shipped to irrigators on the west side of the San Joaquin Valley. He discussed the Tribe’s current efforts to return the fish, now thriving in New Zealand on the Rakaira River, to the fishery to the river above the dam. The Tribe has been forced by NOAA Fisheries to pay for DNA testing to prove that the New Zealand fish are the original strain of the winter run, even though it is clear from planting records that the fish is indeed the original strain. Noah Oppenheim, Executive Director of the Pacific Coast Federation of Fishermen’s Associations (PCFFA), discussed how California’s commercial salmon fishery was “mortally wounded” by a combination of the drought, catastrophic water mismanagement, and excessive south-of-Delta exports. Only 1,123 adult winter Chinook salmon returned to the Sacramento Valley in 2017, according to a report sent to the Pacific Fishery Management Council (PFMC) by the California Department of Fish and Wildlife (CDFW). This is the second lowest number of returning adult winter run salmon since modern counting techniques were implemented in 2003. By comparison, over 117,000 winter Chinooks returned to spawn in 1969. The decline of the winter run Chinook parallels the dramatic decline of spring run and fall run Chinook salmon, Central Valley steelhead, delta and long fin smelt, green sturgeon and a host of other species. In spite of a record water year in Northern California in 2017, the abundance of Delta smelt recorded in the CDFW’s annual fall midwater survey (FMWT) is the lowest in the survey’s 50-year history. Only two Delta smelt were collected at Delta index stations in October. The Delta smelt could be the first fish to become extinct in the wild in the U.S. since President Nixon signed the landmark Endangered Species Act (ESA) in 1973. Maligned by the water contractors as a “little minnow,” the smelt is in fact an indicator species that demonstrates the health of the San Francisco Bay-Delta Estuary. Other speakers at the rally included John McManus, the Executive Director of the Golden Gate Salmon Association; Thomas Joseph, a member of the Hoopa Valley Tribe; Samuel Gensaw III, Yurok Tribal Member; Morning Star, Pit River Tribal Member; and Roger Mammon, President of the California Striped Bass Association, West Delta Chapter, and Secretary of the Board of Directors of Restore the Delta. In addition to the Sacramento meeting, a meeting on the plan was also held in Los Banos the night before and in Chico two days later. The overwhelming majority of people who testified in the two meetings, including many farmers, spoke in opposition to it. A Notice of Intent to prepare an environmental impact statement in accordance with the National Environmental Policy Act (NEPA), “Revisions to the Coordinated Long-term Operation of the Central Valley Project and State Water Project, and Related Facilities” was published in the Federal Register, Friday, Dec. 29, 2017 and can be accessed at https://www.federalregister.gov/documents/current#reclamation-bureau. The written comment period expired on February 1, 2018.